It is this exact human intimacy that defines Thain’s entire oeuvre photographing deeply psychological and emotional portraits of famed artists. Either doused in black and white, or sharp colourful tones, the psyche and emotions of Thain’s sitters seep vividly through his images, as if Thain’s camera is some kind of mind reader. With a special focus on New York’s wild and thriving 1980s art world, Thain’s portraits take us deeper into artists’ psyches than most portraits ever have. One of Thain’s most unique photos is a 1986 Dali-esque, black and white portrait of Andy Warhol, which forms part of a set of the last formal portraits ever taken of the artist. A day later, Warhol went to hospital and never came back out. Alongside this image is an endless bank of artist portraits with the same psychological depth, showing artists like Joseph Beuys (right before his death), Jean Michel-Basquiat, Leigh Bowery, Tilda Swinton, Vivienne Westwood, John Waters, and many more in emotional vulnerability. Currently, a selection of Thain’s portraits are on show at London’s Hempstead May gallery whose Thain retrospective, Deeper, runs until 31 March. In light of the show, below Thain gives us a first-hand account on what it was like to live in and photograph New York’s subcultural 1980s art scene, including the personal story of photographing Warhol for the very last time, and the innovative photographic processes that allow Thain to create such vivid imagery. Alastair Thain: With figures like Robert Mapplethorpe, Cindy Sherman, Jeff Koons, Warhol and Basquiat – underground 1980s New York was a very extraordinary scene. It was very open and free. When I went as a young man form a fairly suburban Bristol existence into that kind of art scene in New York, it was an extraordinary eye-opener. I had no idea these thoughts of behaviours, actions, and thoughts and beliefs were going on in the world. It was an extraordinary revelation of what possibilities life could hold. “It was an interesting time. You could live in New York and London at that time with very little money. You could get a large loft space for maybe $300 a month in the meat-packing district of Soho. You could keep your head above water fairly easily doing three or four shifts as a yellow taxi or biker. Quite a lot of the greatest artists did that. “The result of that was people had to really think about what they're doing in order to really develop their visions. Without that time and space, the whole dynamics of the world in the last 30 years wouldn’t have been the same. There was space, time, and the ability to just think, engage, and socialise freely and openly with all sorts of interesting creative people so there was a real exchange of ideas and lifestyles. It was a world of extraordinary creativity forged on the bankruptcy of the city, real poverty, and real danger. Many things have now vastly got better. It’s not a place where you're living in fear and anxiety of being a victim of violence, in the same way you really were 25 or 30 years ago. Now, it seems that many people just don't have the time or space to develop creatively and within. “I started building my own photographic technique (called a canvas) because I wanted to have the depth and quality of large format film, which is unique in its beauty. There are things that happen between the entropy of the silver tray and the reflection of light, and the organic feel of the film which is extraordinary and unique. When you’re shooting with film, the lighter the negative, the greater the sense of depth, clarity, and detail. Large format cameras tend to use a dark slide so the subject has to be still. For me, I wanted to shoot really fast reactive pictures in the same way I would with a normal medium format or 35mm camera to have the depth and beauty. “Because I was looking at the non-provisional facial expressions that in particular reveal people's emotional states, it was absolutely crucial to that I could be fluid and spontaneous and shoot fastly. Fast! The only way that I could make really active pictures was to capture non-improvised moments when someone reveals perhaps their inner state – moments that have subconscious nuance to them. 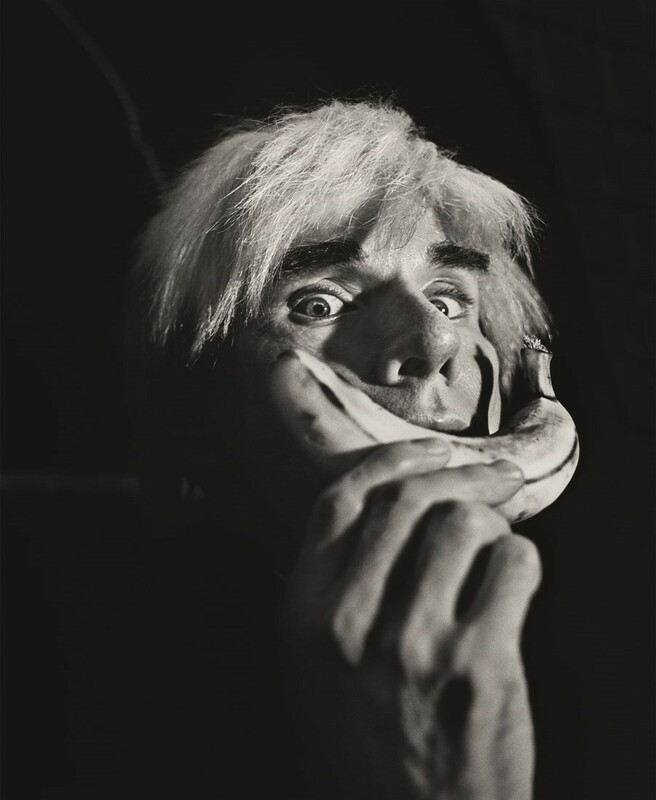 “In this 1989 shot of Andy Warhol, I incorporated the banana because I wanted to choose an icon that he used. At one point I liked the fact it looked like a Dali moustache. I felt that he perhaps gathered a lot of ideas from Dalí. But the important thing about the Warhol session was that I did the session a day before Andy Warhol went into hospital for the last time. I remember waiting for him going to health food restaurants and then meeting up for a bit of fitness training. The next morning, he went into hospital and he never left. So it's almost certainly the last formal portrait ever made of Andy. “I had been photographing his private collection and there’s a real sense of death, because of his fetishes and interests in death. In this session, I also photographed Andy in a death mask so there’s a premonition in a sense of death. When I was processing them after he died, it was deeply disturbing process. Someone that I had a sense of affection for and almost had a premonition of death for, it was a very unusual experience looking at the face in the image getting dark and disappearing. 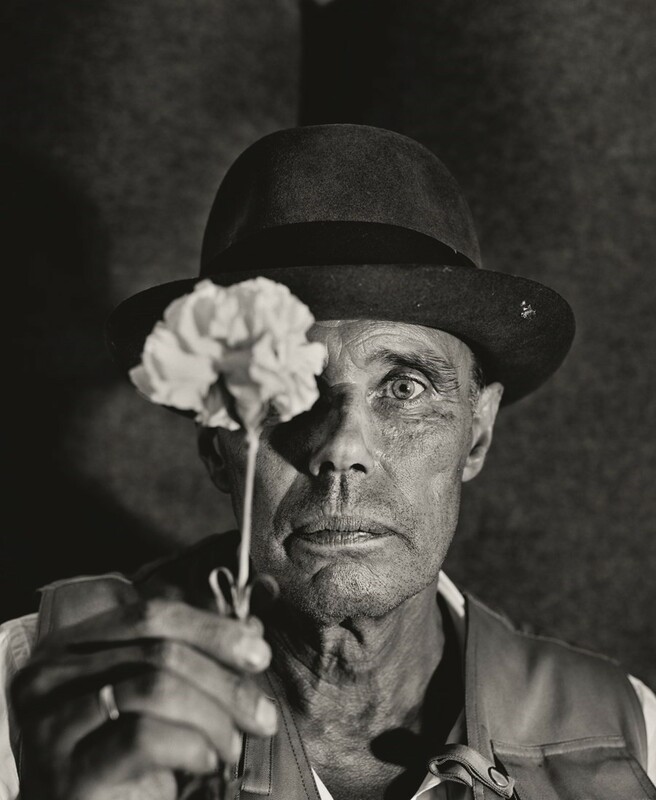 “I spent quite a bit of time with Joseph Beuys – his practice is the major influence on my work. The ideas he had are more prescient than ever right now. 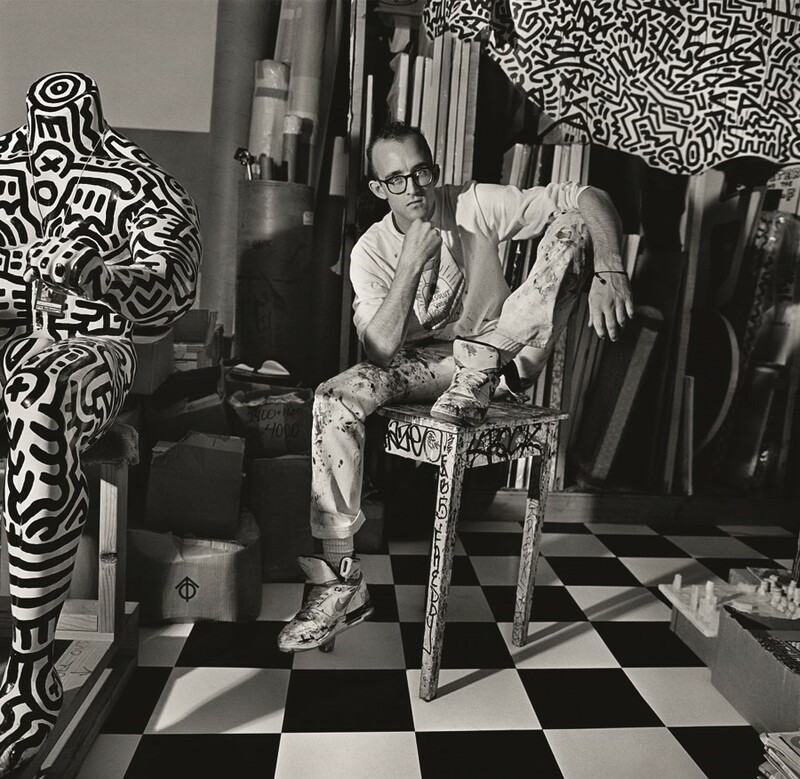 His work was about the inclusive and ecotarian nature of art. He more or less founded the Green party in Germany. This love for the environment is sympathy for the wildest possible social group. He is an example that you can make work that deals with really significant issues in our society, and he shows how we can use art for healing and for connection. He covered the things in life that are most important to us as humans, like human interaction, our relationship with those we care about, and love. Even important things on a social level, such as self-esteem. He made an environment aimed at building social self-esteem, which came about in Beuys’ idea of giving 3000 student grants to anyone who wanted one in Düsseldorf. “I used a carnation with this 1984 image because it has all sorts of symbolism. In Greek mythology, it’s symbolic of aspects of love and death. This picture is important because Beuys was actually dying or in the process of dying when I took it. Within the picture, you can see the fragility and the vulnerability of a human that’s in the process of dying as you would see with any other human in that situation. In this image, there’s the essence of enjoying a beautiful flower, mixed with the pathos of knowing that you have an imminent death. This image has all the elements I look for in a picture. I had a great love for him and enormous admiration, which is present in the pictures I took. 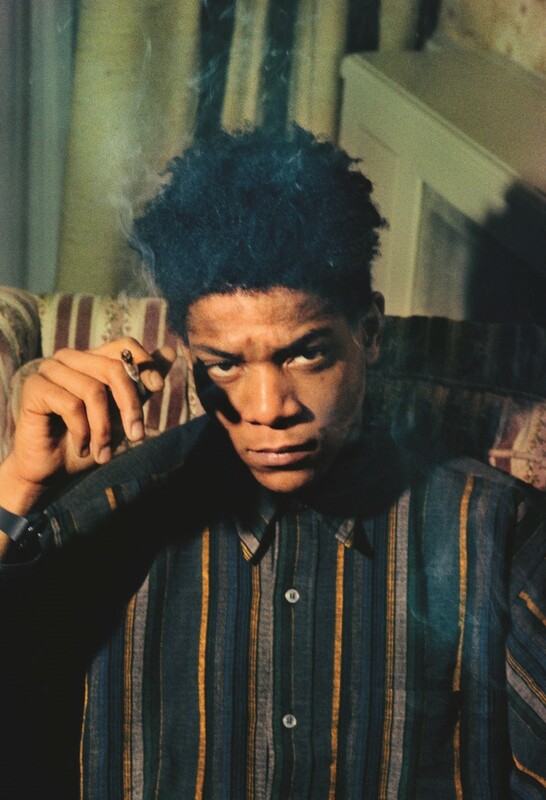 “When I photographed Jean-Michel Basquiat in 1985 it was a very pleasant, relaxed session. Basquiat was perhaps one of the most beautifully charismatic people I ever met. There was a real pathos and vulnerability. In his soul, he was very conscious of the pretty vicious and endemic racism that he grew up within. He was conscious of issues of identity. He was an incredibly gentle, sensitive, vulnerable human being, but with this extraordinary beauty and charisma. Whether or not there’s anything specific in my pictures it's hard to tell. It's a real privilege to take some photographs of someone with that extraordinary charisma and presence. We had quite a good laugh. “In my photography, I did everything I could to try and make portraits that really touched and engaged people. Especially the social work and documentary work I did at some of the early stages of shooting celebrities when I was very young. I did everything in my power to take photographs that really communicate a sense of human emotion and feeling.